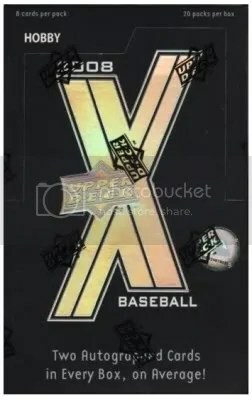 Many collectors have tried to forget about 2008 Upper Deck X Baseball. This product was designed for set collectors. Yes there are (2) autographs inside each box on average, but the chances of you knowing one of the autographs is slim to none. The autographs are mainly of junk players. The die-cut “X” cards look good, but Upper Deck forgot to cut many of the X’s all the way out. 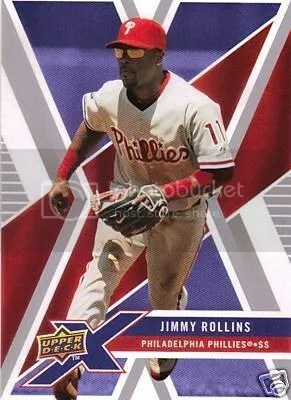 It was a rush job which was suppose to replace Fleer Ultra that year. You gotta admit, the name of this product is the coolest thing about it. It sounds like a secret government organization. Boxes can be picked-up for under $50.00. Cards sneaking out the back door isn’t anything new. 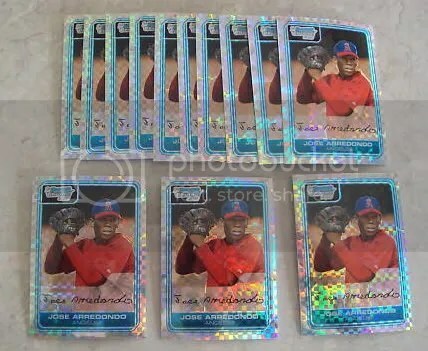 Ever since people realized these small pieces of cardboard containing images of their favorite athletes were worth something, cards have been find their way out the back. This is one of the most annoying things I wish manufacturers could manage better. Just because a card is limited to a certain number, doesn’t mean the manufacturer didn’t make more. Probably the main reason why they printed more was so they could replace damaged cards collectors sent back. The problem arises when someone leaks them onto the market when they have no right being there. They aren’t fake or counterfeit, thats the tricky thing about it. Take a look at this seller. None of these X-Fractors are serial numbered. They should be numbered to 250, but someone rummaged through the Topps garbage bin and took the leftovers. I asked the seller, “Where did you get these?” They told me they bought them at a show in Chicago. I really wish Topps would discard of their garbage in a better manner.